We're delighted to have Alexandra Monir on the blog today. As both an author and a recording artist, she is in a unique position to talk to us about using music in novels. Thanks for being here today, Alexandra! Every author has their unique story of how they broke into publishing. Mine is especially unusual, involving a whole other preceding career as a recording artist. I started performing onstage while in elementary school, and by fourteen I was writing and recording my own pop songs—but all the while, books were my constant theme. I had a voracious appetite for reading, tearing through a few new titles a week. Looking back, it seems that writing my own books was a way of coming full-circle to my earliest passion for reading. But, I’m getting ahead of myself! While I was recording music and performing around L.A. in my teens and early twenties, I started writing stories at the same time. In a way, the music industry gave me a feeling of helplessness—my destiny was always in some record executive’s hands—but when I was writing, suddenly I had my own made-up world that I could escape to, and I didn’t have to rely on someone else in order to create it. Before long, I’d fallen completely in love with writing. Still, I couldn’t silence the musician in me or the melodies that kept popping into my head, nagging me to write and sing them. Then, when I was twenty-three, my life-changing moment occurred. My first book proposal, for a time-travel romance called Timeless, sold to Random House! I’ll never forget the incredulous feeling of hearing the news, the dizzying excitement. And once I began drafting the book, something magical happened. My two main characters, Michele and Philip, began to write music together. I hadn’t planned on implementing music in the book, and I certainly hadn’t included it in my outline—it just happened. And suddenly, there was a deeper reason for my characters falling in love: Philip was the music to Michele’s words. My editorial team was very supportive of including music in the book, and I knew that my readers needed more than just lyric excerpts on the page—they needed to hear the songs, as Michele and Philip would have heard them. So I set about recording their songs with a ten-piece band, which was the ultimate thrill. Hearing the reactions from readers who listened to the songs after reading the book made it all the more special. When it was time for the sequel, Timekeeper, I wondered whether or not to include music again. Maybe it was only meant to be in the first book? But one afternoon, I found myself hearing Michele’s words, what she would say to Philip if she were one hundred percent candid, and those words became the lyrics to “I Remember,” the song featured in Timekeeper. Once again, I got back in the studio and recorded the song for the readers—and this one turned out to be my favorite. Ultimately, when it comes to music and books, the common thread is storytelling. A song takes you on a ride just like a book does—and when that journey needs to be fleshed-out and told over a longer period of time, that’s when the story is a book. But then there are other times when mere words and dialogue aren’t enough to convey heightened emotion…and that’s when you have a song. With the Timeless books, I’d like to think we have both. Readers, what are your favorite songs that fit into a story? Examples: songs from movies and musicals. I’d love to hear your recommendations! 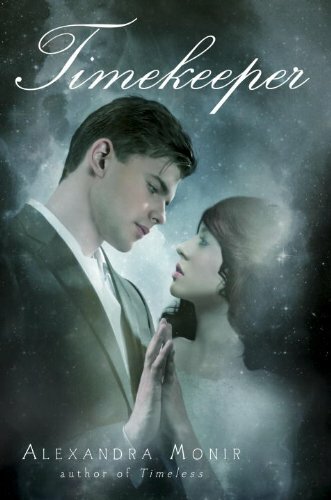 At the age of 25, author and recording artist Alexandra Monir released her debut young adult novel, TIMELESS. The book caught on quickly, with Amazon.com naming it one of the "Best Books of the Month" and Barnes & Noble featuring the title in their "Top Teen Picks." TIMELESS went on to be featured in a variety of media. The sequel, TIMEKEEPER, published on January 8, 2013 and was an immediate Barnes & Noble Teen Bestseller upon its release. Also a singer/songwriter, Alexandra integrated original music into her books’ pages, writing and recording three original songs for TIMELESS and TIMEKEEPER with producers Michael Bearden, Heather Holley and Rob Hoffman. The songs were released on iTunes via Jimmy Buffett’s record label, Mailboat Records. Alexandra currently resides in Los Angeles, California, where she is at work on her third young adult novel, while also blogging for The Huffington Post and recording music. She has two new novels slated for publication with Random House in 2014 and 2015. When Philip Walker appears as a new student in Michele Windsor's high school class, she is floored. He is the love she thought she lost forever when they said goodbye during her time travels last century. Overjoyed that they can resume the relationship they had a lifetime ago, Michele eagerly approaches him and discovers the unthinkable: he doesn't remember her. In fact, he doesn't seem to remember anything about the Philip Walker of 1910. Michele then finds her father's journals, which tell stories of his time-traveling past. As she digs deeper, she learns about his entanglement with a mysterious and powerful organization called the Time Society and his dealings with a vengeful Windsor ancestor. Michele soon finds herself at the center of a rift over 120 years in the making, one whose resolution will have life-or-death consequences. What a cool idea. I will be checking these books out. My daughter is a singer/songwriter and has recently started work on a couple of books. I will be sending her this link! My favorite music from a movie is the theme from Somewhere in Time. I tear up every time I hear it.